Purchase at MusicSpace and enter the code DARDVD to get $4 off through December 5! In May of 2007, Dar Williams performed two concerts in Woodstock, NY and those shows were filmed for a live DVD. 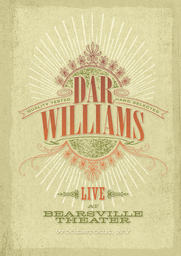 Dar Williams "Live at Bearsville Theater" includes both solo and band sets, and features luminous performances of Dar Williams classics ("Iowa," "When I Was a Boy," "The Beauty of the Rain") as well as a brand new song entitled "The Easy Way."